With this option, the client access the United Planet update server and automatically downloads available updates. Activate this setting if you use a proxy. 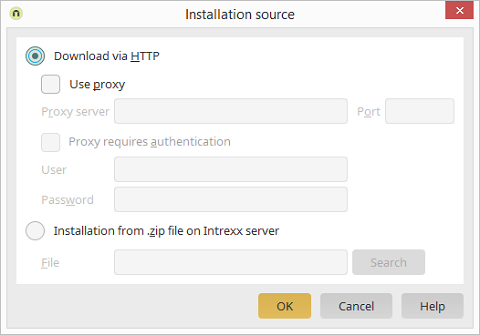 Enter the IP address of your proxy server. The default port is 8080. Activate this setting if authentication is required for the proxy. Enter the username for proxy authentication. Enter the password for proxy authentication. With this option, updates can be downloaded in the form of a ZIP file. The update file can be selected here. Opens a dialog where the file can be selected. Please note that, as opposed to updating via HTTP, all available updates will always be contained in the ZIP file. Only choose this option if updating the software via HTTP is not possible. You can find the current ZIP file for your version of Intrexx in the Support Center.